Method(s): centerfire rifle or bow as specified above. Bow: This is a very good hunt during the rut with bugling bulls. 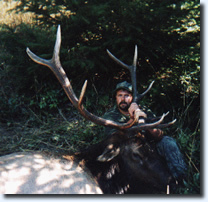 We'll have some really good out of the way places to hunt for these elk. I prefer to get up to higher ground and spend my time glassing; then get as close as possible once we've located the elk. When we get to within 100 yards or less we will get set up and call them in. This is mostly brushy country with a lot of old roads to sneak in on. If the elk fade into the cover, we can then attept to call them blindly, listen for an answer, then sneak in closer to get a shot. A person can get quite the adrenalin rush from this hunt. We usually look for bulls in the 40 inches wide X 40 inches long range. Roosevelt antlers are heavier, with more mass than their Rocky Mountain cousins, as well, their body weight is quite a bit heavier. 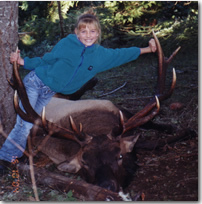 Cascade Bull Elk Season: You have the opportunity to harvest large Roosevelt bulls on private property. These bulls have no other hunting pressure during any season. This is a limited availability hunt, and openings will NOT last long.